We jointly hosted a meeting with Wales Council for International Affairs last night, 16 April. 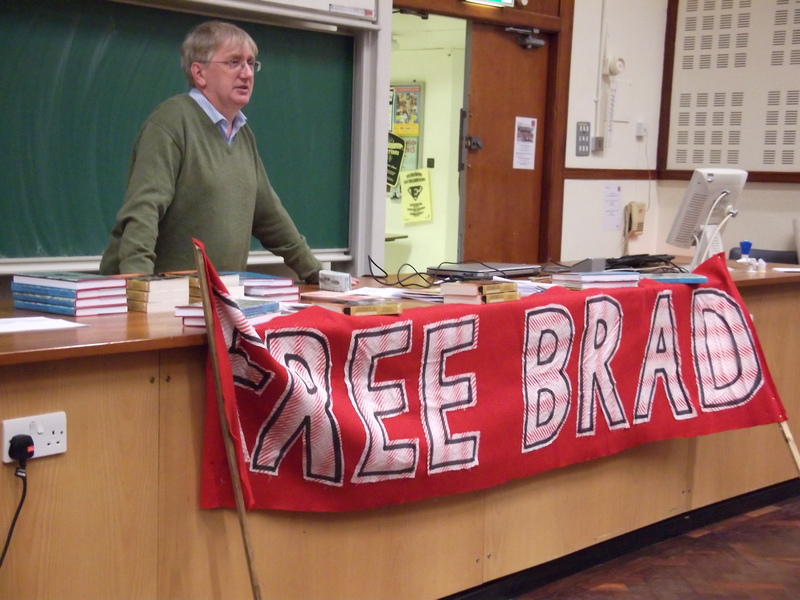 The main speaker was whistleblower Craig Murray, with a short introduction by photojournalist Guy Smallman whose photos from Afghanistan are currently on display at Cardiff Central Library (16-24 April, 2nd Floor by the lifts) along with information about Bradley Manning. Guy has been to Afghanistan on numerous occasions, visiting and photographing places and events that are largely ignored by mainstream western journalists. On 4 May 2007, NATO bombed the village of Granai in Afghanistan and admitted to killing at most 25 civilians during the attack. The Afghan government, the International Red Cross and other organisations concluded that over 140 were killed, all non-combatants. Guy visited the village two weeks after the bombing. He was shown 70 fresh graves, some holding entire families and at the end of the graveyard a single mass grave, 30 metres long where the villagers said they had buried 54 people together. The reason for this mass grave, contrary to Muslim custom, is that these people were at the centre of the attack and were reduced to a mass of body parts. Guy asked how the villagers could be sure that there were 54 bodies. The answer was grim: We don’t know for sure, but we buried 54 heads. At the same time that he is alleged to have passed the Collateral Murder video to WikiLeaks, Bradley Manning apparently also handed over an encrypted film of the cockpit footage from the Granai attack. WikiLeaks is reported to be working on decrypting this so it can be put in the public domain. One day, we may get to see the footage of this attack and the evidence of what really happened. Craig began his talk by saying that he was humbled to speak at an event for Bradley Manning: “I lost my job but I didn’t lose my liberty.” He commented on Bradley Manning’s mistreatment at the hands of the US and the way this was aimed at isolating him from any support, for example the restriction on correspondence while he was in Quantico as well as the harassment of those publicly supporting him, such as Pentagon Papers whistleblower Daniel Ellsberg, who was arrested at a demo for Bradley Manning. Whistleblowing is not restricted to the field of diplomacy, foreign policy and war, but is found across a very wide range of bodies including corporations, local government and public services for example. Craig was an unlikely candidate for a whistleblower and was not associated with human rights before going to Uzbekistan in 2002. He had been a diplomat for 20 years and was ambitious and focused on his career. Uzbekistan lies to the north of Afghanistan and is a close ally of the US and the UK in the “war on terror”, providing logistical support to NATO in Afghanistan. It is a totalitarian state with one of the most repressive regimes on earth. Its citizens need an exit visa to leave the country and an internal visa to travel within Uzbekistan. If you’re a cotton worker, you wouldn’t be able to get such a visa. You can expect your identity to be checked several times a day. In a country where 90% of the population is Muslim, people are thrown in jail for growing a beard, having a Koran at home or praying five times a day. The only worship permitted is to attend the state-ordained mosque once a week. Craig then started to query evidence Britain was receiving from the CIA. The CIA and MI6 share all their intelligence reports and British ministers consider this sharing agreement essential, but in the case of Uzbekistan MI6 didn’t have a presence because it was considered “too dangerous” so Craig was just receiving all the CIA intelligence reports detailing what those who’d been interrogated under torture had said. They always admitted to being a member of Al Qaeda or the Islamic Movement of Uzbekistan, they always admitted to having attended a training camp in Afghanistan and often that they had met Osama Bin Laden in person. The reports never named the person being interrogated, just stated that the “detainee” had confessed to all these things. Although this was in 2002-3, little more than a year since 9/11, none of the detainees who were supposed to have met Bin Laden were ever asked “Where did you meet him?” If the intelligence had been genuine, of course this line of questioning would have been followed to try and establish where Bin Laden might be found. Concerned about these CIA reports and the fact that he had never met a single detainee who had NOT been tortured, Craig sent his deputy to the US Embassy to raise concerns that evidence was being obtained through torture. The reply came back that they knew about this but didn’t see it as a problem in the context of the “war on terror”. Craig then wrote to Jack Straw with evidence, pointing out that the practice is illegal, immoral and impractical since the evidence obtained isn’t true. Every single time Craig was able to check the veracity of a report, it was found to be false. The victims of torture were often forced to denounce a long list of other people alleged to be members of Al Qaeda. One list Craig saw named a university professor he knew who was a Jehovah’s Witness. The evidence simply wasn’t credible. Many of the people admitting to being in Afghanistan simply could not have been there given all the travel restrictions within Uzbekistan and the forced labour conditions of work. The CIA reports were just not credible. Craig was called back to a meeting at the Foreign Office, where they were very unhappy with him – it simply wasn’t acceptable to be querying anything relating to the “war on terror”, particularly intelligence, just a matter of weeks before the US and UK invaded Iraq on the basis of false intelligence many were already questioning. The Foreign Office did not want to hear that their intelligence was a load of rubbish. It was at about this time that the Deputy Legal Adviser to the Foreign Office, Elizabeth Wilmshurst, resigned over the Iraq war. Many others were questioning what was going on and considering whistleblowing, but did not. Craig was not sacked at that point, but was told that it was perfectly legal to get evidence from torture provided we don’t do it ourselves and don’t use it in court. This is still the case now. As a matter of policy, the Foreign Office had decided that Britain could use intelligence from torture in the “war on terror”. At a later meeting, Craig was told that the major motivation for this policy was ministers’ desire to keep the intelligence sharing agreement between the UK and US. The US were waterboarding detainees all over the place and flying them around the world by way of “extraordinary rendition” but because the ministers didn’t want to cancel the agreement, they went along with the torture and eventually the UK started doing its own torturing. Throughout the Foreign Office, people are working with “facts” they know to be false. Intelligence analysis has become a propaganda weapon: instead of the facts informing policy, the government wanted “facts” to support their position. Craig believes that at one time people simply would not have been prepared to put out facts they personally knew to be false and that standards in public life have slipped as well as the standards of the journalists reporting on events, who may previously have exposed wrongdoing rather than blithely trotting out the government line. Craig pointed out how we heard earlier from Guy about how the NATO report of the attack on Granai was at odds with the facts collected on the ground. For nearly ten years the mainstream media have routinely linked the Taliban with narcotics production and smuggling, even though the largest producers and smugglers are warlords who are also President Karzai’s ministers. We simply don’t hear that heroin production in Afghanistan is higher than ever before. Four years ago it was 60% higher than the highest ever year before the invasion and it’s grown steadily every year since. Afghanistan used to export mainly opium. Now it’s processing it into heroin for added value, controlled mainly by Karzai’s warlords. Heroin production is, quite simply, a consequence of the invasion. In another example, compare the reporting of the attack by Syrian government forces on Homs with the NATO bombing of Sirte in Libya. More people were killed in the latter, but you would never know that from mainstream media reports. Nor was it reported when Russia blocked a UN Security Council resolution on Syria that the stated reason for this was that the UN resolution on Libya, where the mandate had been to protect civilians and maintain a no fly zone, had been used by NATO as an excuse to carpet bomb the area, killing and injuring thousands. Time and again the narrative presented by the media to the public is false. There is a great need for a counter-narrative, which is where whistleblowing and independent report on the internet become important. In Uzbekistan, it turns out there are powerful US corporate interests, in the form of Enron wanting to build a pipeline for natural gas to Europe across Afghanistan. The line would be built by Unical, which has George Bush Senior on its board. President Karzai is negotiating at the Afghan end. When you find out that there’s a story behind the news that hasn’t been reported, it’s almost always to do with a sordid deal – oil or gas or money to be made from war – being made by grubby corporations like Enron and grubby politicians like George Bush. Craig’s view is that if we lived in a proper democracy with honest politicians, you wouldn’t need whistleblowers. Poor Bradley Manning is suffering at the hands of the US, while those in the helicopter who carried out the attack go free. Whistleblowers are almost always made into scapegoats. Craig Murray answered some questions from the audience before the meeting was closed by Martin Pollard of the WCIA at 8pm.